Coleman Project Space is pleased to present new sculptures and works on paper by Martina von Meyenburg. ‘A Lot or Knot’ is the Swiss artist’s first London solo exhibition. The histories of found objects and materials form the basis of von Meyenburg’s sculptural investigation. As a collector and curator of “traces”, the visceral and associative evidence of the previous lives of things, she is interested in how particular material combinations and modes of display can alter our relationship to the ‘data’ presented. 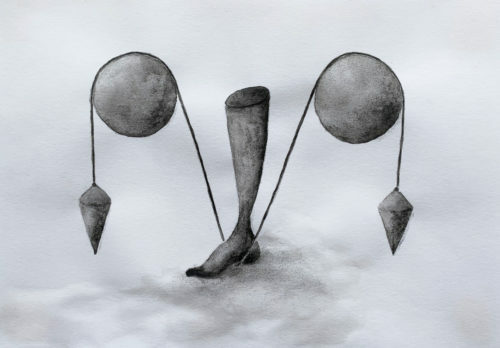 In ‘A Lot or Knot’ the artist pushes the playfully surreal and instinctive aspects of her practice. With an open remit, she has approached the construction of works and their placement in the gallery – as individual elements and part of a connected whole – with the curious physical particulars of the site in mind. As the title suggests, von Meyenburg is focused on the binds that tie – the obvious and less palpable facets of a series of material conversations. In some works, this is played out quite literally: chairs lashed together with rope, tangle-haired mop heads brooding in corners, pillows tied to pitchforks, using all manner of trusses and textiles, and in ways reminiscent of the forced introduction that yields an unexpected response. While, in others, the idea of a shared territory or possible connectivity appears to have been given space in the room to develop, with the artist as custodian feeding its growth. In one corner, for example, yellowing discs of beautifully handmade lacework have been tacked roughly together, in basic suture stitch, to create an amorphous cloud-like stain that makes the gallery appear as if host to a domestic contaminant. 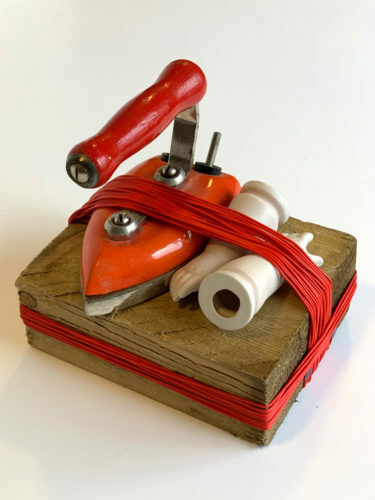 In addition, von Meyenburg will show some of her small-object sculptures and works from an ongoing watercolour series, in which she imagines other lives for the things in her collection.